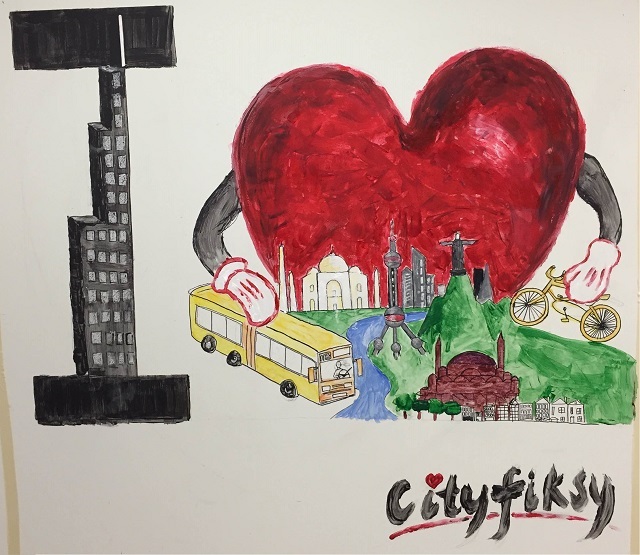 TheCityFix’s own mural: “Cityfiksy”. Photo by Andrew Stokols. Street art can do a lot for a city: improve traffic safety, engage local political and social issues, and contribute to the vibrancy of urban communities. In many urban neighborhoods worldwide, street art is no long perceived as a public nuisance or a degradation of public space. In fact, many cities have adopted official programs that sponsor recognized artists or engage the public, cultivating a culture of local street art. Since we are currently renovating our office here at TheCityFix, we took this opportunity to highlight to some of our favorite examples of street art across the world, and to do a little painting of our own. Last month, the city of Rabat, Morocco introduced Jidar, an event showcasing street art. The event engaged the entire city, and local architecture acted as the backdrop for artists from Morocco and beyond. In addition to the event’s official artistic contributions to the city, it was also intended to motivate people to integrate art into the urban environment on their own. One of the event’s directors described how “taking inspiration from public space is key to the festival.” Jidar also featured workshops and street art-oriented discussions and documentaries. Moreover, this event represents how Moroccan street art is branching out from its origins. Through 2015, the Mohammed VI Museum of Modern and Contemporary Art in Rabat plans to profile street art in an exhibition. To see more photos, check out the Jidar website. 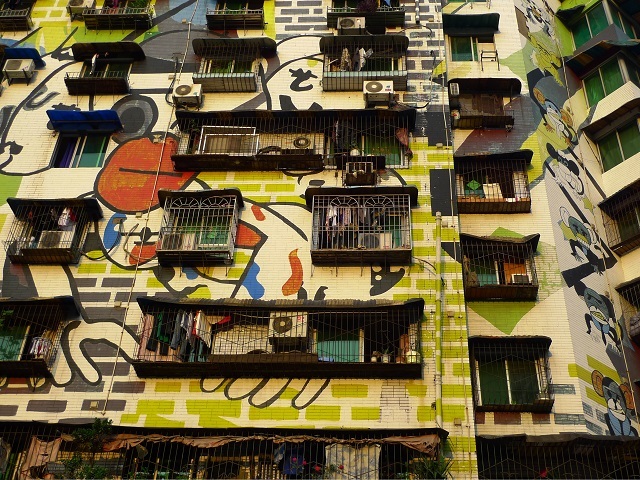 “Graffiti Street” in Chongqing, China covers approximately 40,000 square meters of building facade. Photo by Drew Bates/Flickr. Chongqing, China, is home to “Graffiti Street,” which is one of the world’s most notable graffiti-laden roads. Spanning approximately 40,000 square meters, some buildings’ exteriors are now exclusively covered in graffiti. However, Graffiti Street was constructed with intention. Zhou Zongkai, a vice dean at the Sichuan Fine Arts Institute, received a grant from the government in 2006 to finance Graffiti Street, and the rendering was made by Zongkai’s animation business. At this time, and due in part to the prominence of the Institute, the area became a recognized art district. Approximately 800 artists (and student-artists) helped make Graffiti Street, which is said to include 12 tons of paint. Julien Malland has been working with local artists in Shanghai to produce street art that engages with local themes. Photo by Li Ze and Zhang Chi. In Shanghai, street art has a large international influence – Julien Malland, a street artist from France, has actively improved the city’s landscape with art. His murals can be found in two notable contexts: in the first, his murals conveyed the mood of the city amidst massive reconstruction. 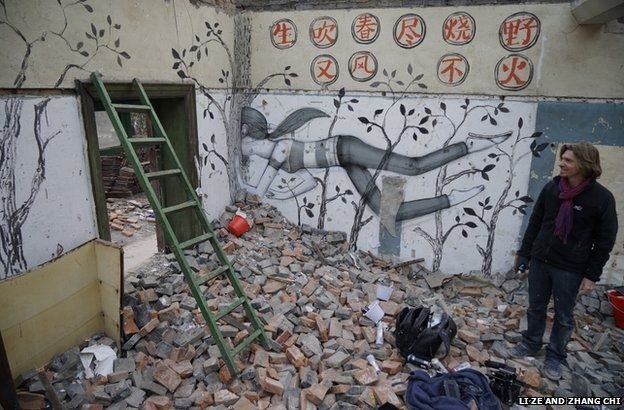 He worked alongside Shi Zheng, an artist from China, to paint the dilapidated buildings. However, the government mandated that the murals be taken down. To commemorate the start of our office renovation, TheCityFix decided to paint a mural on one of our blank walls. “Cityfiksy” was inspired by renowned street artist Banksy, and is a tribute to cities worldwide.